Designed for teens, this site includes information about how different drugs, including nicotine, affect the brain. A useful tool for educators, this site details the latest research, and provides information, publications, and news releases on alcohol use and abuse. Buzzed: The Straight Facts About the Most Used and Abused Drugs from Alcohol to Ecstasy. Kuhn, C., Swartzwelder, S. and Wilson, W.
New York: W. W. Norton & Company, 2003. A highly informative, detailed review of widely abused drugs. Designed for teens, this site includes information about how different drugs, including nicotine, affect the brain. Also available for free by calling 1-800-729-6686. 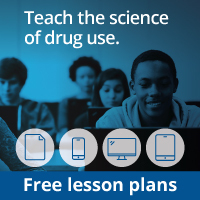 Designed for teens, this site provides information on several drugs, including nicotine, as well as quizzes and real-life stories. Covers a wide range of alcohol-related issues and contains advice columns, word games, and an interactive tool that explains alcohol’s effects on different parts of the body. This NIAAA Web site, created for middle school students, covers a variety of peer pressure issues and discusses the myths and facts of alcohol. Part of the “Drugs: The Straight Facts” series. Philadelphia, PA: Chelsea House Publishers, 2003. Contains a thorough discussion of alcohol-related issues, including history, health effects, usage trends, and alcoholism. Part of the “Drugs: The Straight Facts” series. Philadelphia, PA: Chelsea House Publishers, 2003. Contains a thorough discussion of nicotine and smoking, including history, health effects, usage trends, and addiction.